SWM has further moved into Southern Sri Lanka. Maldives and Northern Andaman Sea. Galle in Sri Lanka recieved 63mms of rain and Ratnapura got 30 mms on Saturday, 26th, while Colombo measured 15 mms. Cross Equatorial Flow has picked up considerably in the Bay and Arabian Sea. Winds over 30-35 knts are seen gushing Northwards off the Somali Coast, and 40 knts winds are seen in the Bay. Winds off the Sri Lanka coast have picked up considerably. Today's SST map is reproduced here to show the Sea temperature not falling sufficiently yet along the Somali coast. It is presently around 24c. Now, this difference with the Central Arabian Sea plays a key role in cloud formations off the Western Coastline of India in the Central Arabian Seas. The SST along the Somali coast will rapidly fall to around 18/20c in the next 10 days. But the current fall is sufficient to help form Monsoon clouds around the Maldives. Cloud formation near Sri Lanka is gathering, and in next 24 hrs, wind speed along the Sri Lanka coast is estimated at 35 mph (in gusts). A slight fall is seen in the Bay water's SST. The ITCZ is slowly moving up, but is still around the Equator regions, and in the 5N region in the Bay sector. 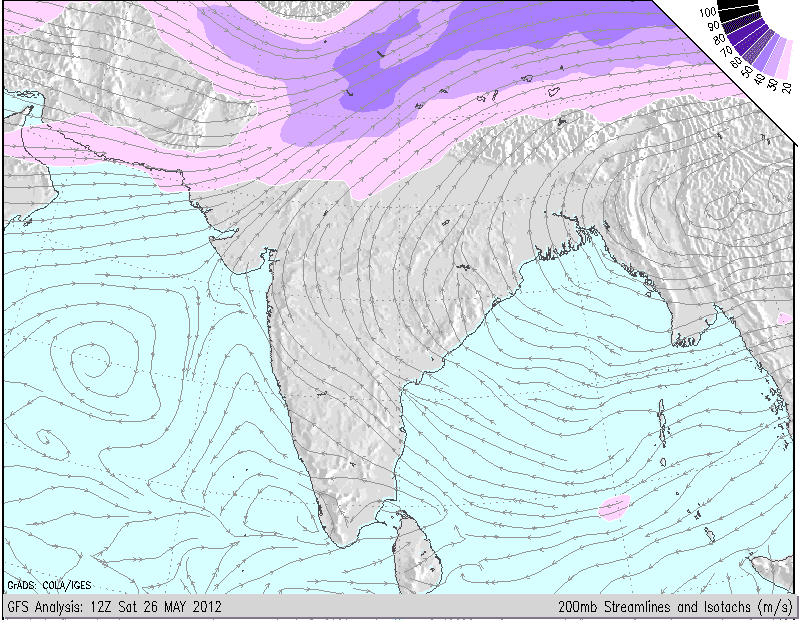 SWM should set in over Sri Lanka within next 24 hrs, that is by the 28th May. The Seasonal Low seems to have strengthened. We see today's pressure at 998 mb. Getting gradually ready enough to create a gradiant to pull up SW winds into the mainland. The day temperatures on the Sub-Continent Northern plains are on the higher side since Wednesday, with the average the day's highs are around 42/43c. Across in Pakistan' Sindh region, the core area for the formation of the low, the highest was 46c on Saturday. M-5 effect was expected bring about a slight fall in the day readings(reported in Vagaries yesterday). M-5 is seen moving away from India. WDs should slow down now, as the jet streams at 200 hpa are re-grouping fast into position. 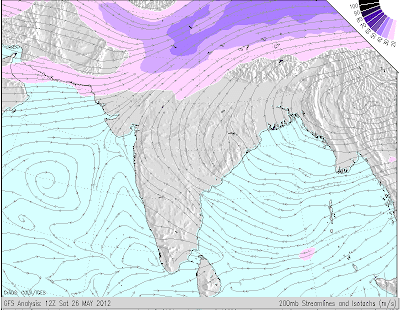 The Jet Stream Westerlies are almost upto the 15N line, and the "High" formation is taking shape East of Bangladesh. Expected movement of this "High" should be inland towards MP for perfect position. The Bay sector SWM has been stagnant, and not picking up as expected from a "setting in" Monsoon. Its lack of systems could be attributed to M-4/5. Strong westerly currents prevent the formation of lows to move into the bay and towards the Indian mainland. They divert the forming currents. As SW winds should pick up speed in the next 2 days, SWM "in situ", could advance further into the Bay. Better before another WD reaches the region to spoil the "party". Conclusion: SWM advancing into Sri Lanka by 28th (late by 3 days). Advance into Kerala around Vagaries' expected date, 3rd/4th June. But, further advance would need monitoring. Possibly into Coastal Karnataka and Southern TN regions by the 7th of June. South Konkan and Goa around 8th June, and Mumbai by 13th/14th June. Keep Checking Monsoon Advance Map on "Current Weather Page"
A local heat vortex developing may bring about a thunders shower in and around Chennai on Sunday,27th. See Mumbai Forecast on Mumbai Page. Gwalior @ 34.5c.......Minimum Temperature Saturday Morning ! Apparently monsoon has progressed further in parts of maldives...now that was quick..any confirmation?? Ron: Please check SWM advance map on current weather page..its always updated as per vagaries. Refer blog of 23rd also. Thanks. in the morning the clouds have thickened and it was very cloudy in the morning!! !very uncomfortable weather today!!! !desperately waiting for the pre monsoon showers,,,@rajesh any estimate wen will south konkan (ratnagiri-vengurla) belt receive premonsoon showers??? junaid: South Konkan should recieve pre-monsoon showers by around 2nd/3rd June. Pavan n RK: Thanks for the good wishes. I personally see the SWM moving into Kerala by the 3rd/4th as put up earlier. Further progress will also be as per the estimated dates put up on vagaries. However, the June rainfall forecast map put up in vagaries shows some deficiency in pockets due to the sluggish start. Since last 5-6 years we are getting system in Arabian sea in first week of june(most of them moved westward). Any chance of Arabian sea system this year?